These handy anchors with a white finish are 10.5 inches tall by 6 inches wide. These beautiful nautical boat anchors are reminiscent of the anchors used on ships in small sea port villages and on fishing vessels of the past. They are crafted from resin and feature sisal fishing rope embellishment. They are created to be an excellent display and decor item in any nautical room, kitchen, bathroom, mudroom or poolside. Everyone loves the beach, the seaside, nautical decor and all things tropical. Your guests will be jealous of your clever design ideas and creative uses for these fabulous anchors. Love shabby chic? 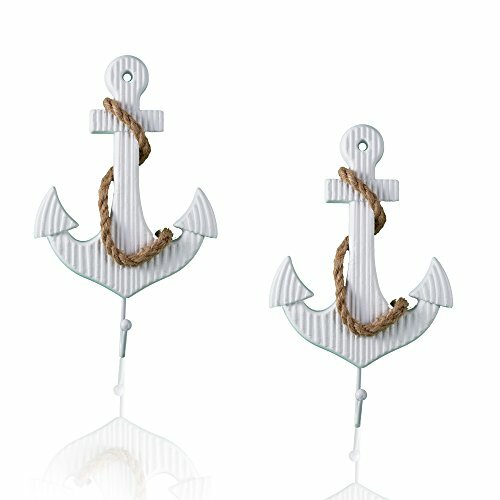 These Nautical Anchors looks amazing in a shabby chic home. Every time you look at this beautiful wall hanging you will be reminded of your favorite day on the water! Everyone wants to receive a great gift and of course every great gift should be useful. It is an amazing gift if it is visible every day as a reminder that you care enough to give only the best! A perfect gift for Mother's Day, Father's Day, Birthday or Housewarming. Fancy nautical design reminiscent of anchors used on ships in small seaports. Generous size - 10.5 inches tall by 6 inches wide. Perfect for hanging hand, bath or pool towels, bathing suits, keys, or even dogs leashes. Saw tooth hanger on the back, top, center of the anchor for sturdy hanging. If you have any questions about this product by Tumbler Home, contact us by completing and submitting the form below. If you are looking for a specif part number, please include it with your message. Frog Bath 5 Cent Soap & Towel Extra Bathroom Wall Decor Sign Plaque 5"x10"